On my recent visit to Paris, which is one of my favourite city in the world, I went to the Marché des infants rouges which I think means the market of red children, bizarrely named I know. 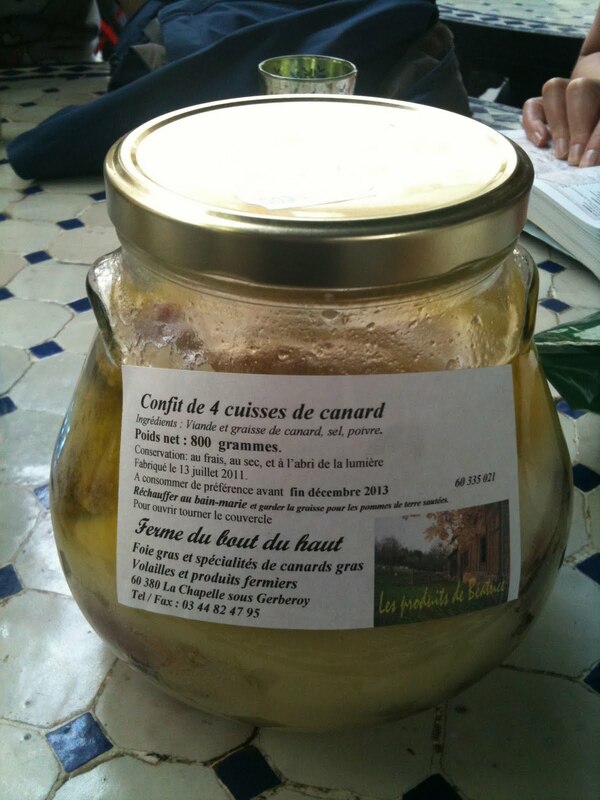 I came across this wonderful jar of duck confit. It was love at first sight and so after parting with €24, it was on the same Euro star journey home with me. Today, I think will be a good time to cook it. I have been trying to come up with ideas of what I might serve with it. Given that the duck itself is quite rich. It had after all been braised gently in its own fat for hours and then bottled up to preserved it. I though I might prepare something light and perhaps sharp to balance the duck. The usual suspect of potato dauphinoise is out of the question so I came up with celeriac mash. The anisee flavour of the celeriac should go nicely with the richness of the duck. As I have some of the homemade spicy tomato sauce from my previous meal, so I thought I ought to use it up just to be frugal. The sharpness of the sauce should cut through the fat nicely too. So I came up with a simple ratatouille-style dish. To start, I take the duck legs out of the jar and scrapped of as much of the fat as possible. I then heat up an ovenproof frying pan and place the legs skin side down for a few minutes to brown skin. They are then turn over and pop straight into the oven at 200 degrees for about 20-25 minutes. This should crispen up the duck nicely. During this time, I boiled some potatoes and celeriac until soft, and then drained them and mashed them up with a knob of butter and some double cream. They are then seasoned with freshly ground black pepper and sea salt. As for the ratatouille, I've diced up an aubergine, a couple of courgettes and some red onions into even cubes of roughly the same size, about an 1/2 inch thick. These are then pan fried separately so that each retained it's own distinct flavour. This is my tips for the most perfect ratatouille. If you cooked them all in the same pan, the flavours will mix and all you get is mushy mess. Once they are cooked, I then heat up the tomato sauce and then right before serving, I add all the vegetables to the pan and mix gently until warmed through. I think this is definitely a great alternative to a traditional Sunday roast. Singapore Half-Boiled Eggs - 100% Pure Egg Perfection! A Singaporean Peranakan living in the big smoke. This is me sharing my love of food I cook and eat and sometimes my Nyonya heritage cuisine. Writing and photography copyrighted © unless otherwise indicated.You may not copy or otherwise reproduce any of this material without prior written permission. All rights reserved.